(2) Ability to operate without the presence of any electrode makes nanoparticles obtained as pure as the raw material without suffering contamination from the evaporation of the electrode. (3) Compound, core-shell, oxidized/non-oxidized and other various composition are possible. 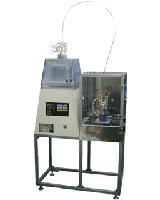 (5) From 4 ml/batch (NJ10) to 60 liter /h (JN1000) production model is available. Carbon nano-tube (CNT), Barium Titanate, Cellulose, Carbon black, Nickel, cosmetics, pharmaceuticals, foods, cluster water, etc. (2) NAFITEC screen ? coated by nano particles ? is creating new market == more air flow with finer mesh, less agglomerating with same mesh, etc.